My Content folder. 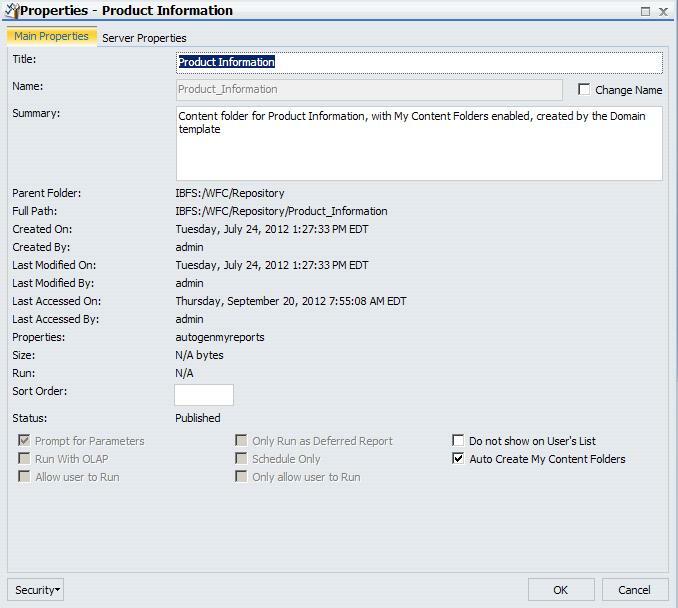 Created when the parent folder has the Auto create My Reports folder property selected and the user is permitted to create private content in a My Content folder. Provides the user with a location to create private reports, output, and schedules. The private content within this folder cannot be published. Library Report. Library reports can contain links to Web resources (live links) and to other reports (drill-downs).The Report Library provides secure access to library content and it allows the user to save multiple versions of the same report output, set an expiration date, and keep a specified number of versions. The Report Library is only available to ReportCaster users who have been granted library privileges. Watch List Report. Is a report of particular interest that the user subscribes to in the Report Library. Each time a new version of the report is distributed, the user receives an email notification. For details about using the Library Versions option to view Report Library content, see Viewing Reports in the Report Library. For details about using the Schedule option to schedule reports, see the ReportCaster manual. Enables you to create a report in InfoAssist. Makes a copy of the item with an underscore and number appended to the title, for example, duplicating Sales_Report creates Sales_Report_1 in the same location. The number is incrementalized each time a duplicate is created. Submits a report procedure or schedule. Schedules a report procedure. Scheduling options include Email, FTP, Printer, Report Library, and Managed Reporting. Enables you to create a new report, chart, dashboard, or document using InfoAssist. Like report procedures, Save Parameter report procedure (FEX) options include the Run, Run Deferred, Run With SQL Trace, Edit, Add to Favorites, and Add to Mobile Favorites options, as described in Options for Procedures (FEX). The context menu for a Save Parameter report from an HTML Composer page, is shown in the following image. Like folders, Schedule options include the Duplicate, Cut, Copy, Delete, Change Title, Share/Unshare, Share with, Security, and Properties options, as described in Options for Folders. Like folders, Distribution List and Library Access List options include the Duplicate, Cut, Copy, Delete, Change Title, Publish/Unpublish, Show/Hide, Show/Hide, Security, and Properties options, as described in Options for Folders. 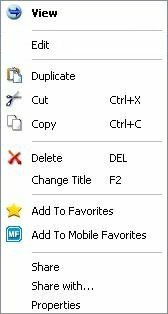 Like folders, these options include the Duplicate, Cut, Copy, Delete, Change Title, Publish/Unpublish, Show/Hide, Show/Hide, Security, and Properties options, as described in Options for Folders. Note: Edit, which is available for HTML files, launched the Text Editor. The Properties dialog box for a folder displays tabs for Main Properties and Server Properties. Name. Unique reference to the item within the folder. Summary. Detailed explanation users can view to obtain additional information on the folder content. Auto Create My Content Folders. Specifies whether WebFOCUS will create a My Content folder for users with the My Content Folder privilege so the user has a place to save personal reports, charts, or documents they may create using InfoAssist or other report and distribution features, such as Save Parameter reports. The following image shows the information that the Main Properties tab displays for a folder. The Properties dialog box for an item displays tabs for Main Properties and Server Properties. Name. Unique reference to the item. Allow user to Run. Allows a user not permitted to access the Reporting Object tool to run the Reporting Object interactively using the Run or Run Deferred options. 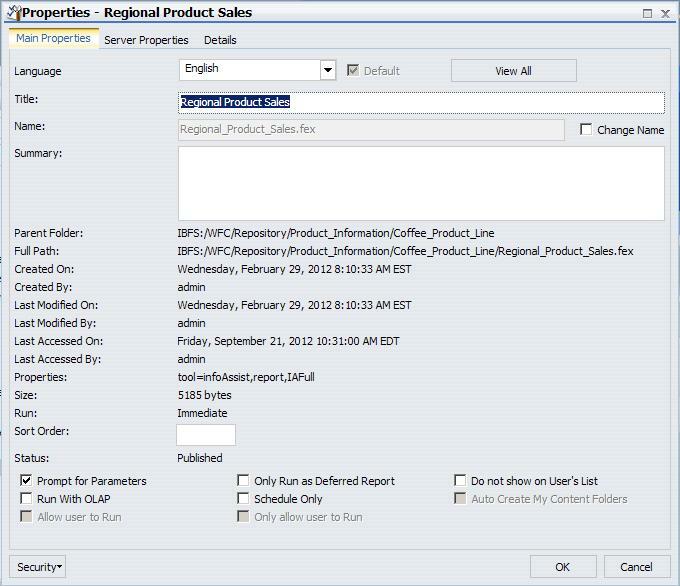 The Details tab displays the components of the report procedure in a tree structure to allow a user to review the request information prior to running or opening the report in a tool. The tree structure displays the request components as folders MasterFiles, DataElements, Sorts, Conditions, Expressions, OutputFormats, and Joins that can be opened to show the fields referenced. The following image shows the information that the Details tab displays for a report procedure (FEX). Note: For information on Reporting Objects, see Creating Reporting Objects.